Co-founder and president, SunRun Inc. Many environmentally-minded folks like the idea of installing solar panels on their home, but find it's just too expensive. Enter SunRun, a start-up that pays for the panels and installation; homeowners then buy solar power from SunRun at an average savings of 10% to 15% versus their current energy bill. 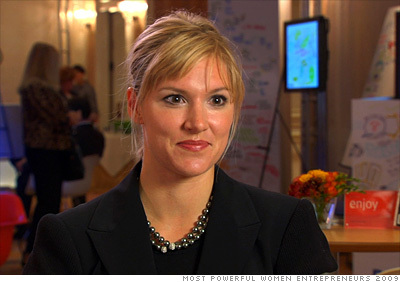 Jurich and her business partner started SunRun in 1997 while attending Stanford Business School. But Jurich didn't get a lot of encouragement from her classmates. "That's one of the problems of business school, is that people love to shoot down ideas, they love to say 'that's not going to work,' " she explains. But even with a job in venture capital finance waiting for her at graduation, Jurich took the entrepreneurial route. SunRun has since raised $30 million from Accel Partners and Foundation Capital, and this week secured $90 million in tax-equity financing from U.S. Bancorp, following an earlier commitment of $105 million in project financing. Jurich's idea also earned her a ticket to the White House: In early December, she attended a roundtable with President Obama to discuss renewable energy and ways to expand solar adoption in 2010. Her hope is that the U.S. replaces half of the $150 billion annual residential electricity market with solar power over the next two years. --J.S.